Electricity arrived when they decided to build their own hydroelectric dam together, not only to light up the night, but also to take small steps towards undertakings that help improve living conditions in the village. Now she uses a refrigerator to make “charamuscas” – ice cream made from natural beverages, which she sells to generate a small income. “With the money from the charamuscas I pay for electricity, food and other things,” the 64-year-old Gómez, head of one of the 40 families benefiting from the El Calambre mini-hydroelectric plant project, told IPS. 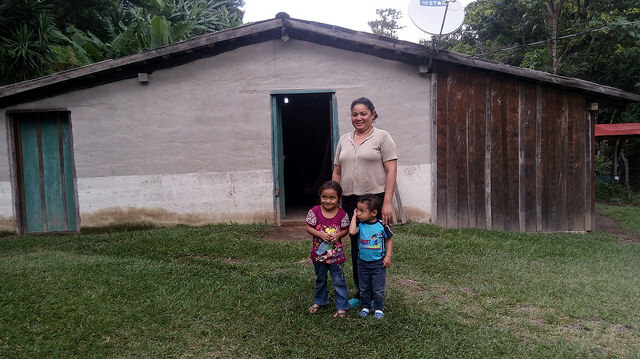 This is a community initiative that supplies energy to La Joya de Talchiga, one of the 29 villages in the rural municipality of Perquín, with some 4,000 inhabitants, in the eastern department of Morazán, which borders to the north with Honduras. During the 1980-1992 civil war, this region was the scene of fierce battles between the army and the then-guerrilla Farabundo Martí National Liberation Front (FMLN), now a political party, in power since 2009 after winning two consecutive presidential elections. When the war ended, the largest towns in the area were revived thanks to ecotourism and historical tourism, where visitors learn about battles and massacres in the area. But the most remote villages lack basic services, which keeps them from doing the same. The El Calambre mini-hydroelectric power plant takes its name from the river with cold turquoise water that emerges in Honduras and winds through the mountains until it crosses the area where La Joya is located, dedicated to subsistence agriculture, especially corn and beans. A small dike dams the water in a segment of the river, and part of the flow is directed through underground pipes to the engine house, 900 metres below, inside which a turbine makes a 58-kW generator roar. La Joya is an example of how local inhabitants, mostly poor peasant farmers, didn’t stand idly by waiting for the company that distributes electricity in the area to bring them electric power. The distribution of energy in this Central American country of 6.5 million people has been in the hands of several private companies since it was privatised in the late 1990s. During the days IPS spent in La Joya, locals said they own the land where they live, but they lack formal documents, and without them the company that operates in the region doesn’t supply electricity. It only brought power to a couple of families who do have all their paperwork in order. In this Central American nation, households with electricity represent 92 percent of the total in urban areas, but only 77 percent in rural areas, according to official data released in May. 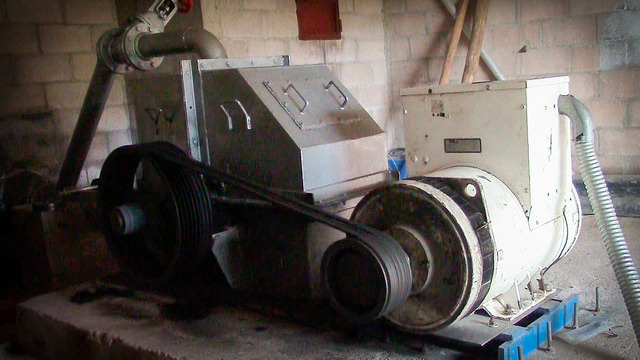 Without much hope that the company would supply power, the residents of La Joya set out to obtain it by their own means and resources, with the technical and financial support of national and international organisations. One of these was the association Basic Sanitation, Health Education and Alternative Energies (SABES El Salvador), which played a key role in bringing the initiative to La Joya, where it was initially met with reservations. “People still doubted when they came to talk to us about the project in 2005, and even I doubted, it was hard for us to believe that it could happen. 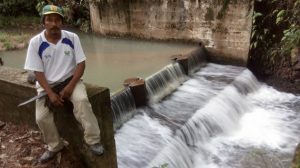 We knew how a dam works, the water that moves a turbine, but we didn’t know that it could be done on a small river,” Juan Benítez, president of Nuevos Horizontes, the community development organisation of La Joya, told IPS. The small hydroelectric plant, in operation since 2012, was built by local residents in exchange for becoming beneficiaries of the service. Paid workers such as electricians and stonemasons were only hired for specialised work. The total cost of the mini-dam was over 192,000 dollars, 34,000 of which were contributed by the community with the many hours of work that the local residents put in, which were assigned a monetary value. The charge for the service is based on the number of light bulbs per family, at a cost of 50 cents a month each. Thus, if a family has four light bulbs, they pay two dollars a month, lower than what is charged commercially. Local residents still remember how difficult life was when they had no hopes of getting electric power. “When I was a girl, things were so hard without electricity, we had to buy candles or gas (kerosene) to light candles,” one of the beneficiaries, Leonila González, 45, told IPS as she rested on a chair in the hallway of her house, located in the middle of a pine forest, 30 metres from the river. Most residents, she recalled, used to use “ocotes,” the local name for pieces of pine wood, whose resin is flammable. “We would put two splinters in a pot, and that’s how we lived, with very dim light, but that’s how it was for us,” she said. Meanwhile, Carolina Martinez, the teacher who works at the village preschool, pointed out that in those days the children’s homework was stained with charcoal soot from the ocote. She and her family used to buy car batteries to run some appliances, which implied significant costs for them, including payment for the appliances and the person who brought them from nearby towns. Others who needed to work with more powerful devices, such as saws for carpentry, had to buy gasoline-powered generators, she said. And those who had a cell phone had to send it to Rancho Quemado, a nearby village, for recharging. “Now we see everything differently, the streets are illuminated at night, it’s no longer dark,” Martínez said. For the village carpenters or welders, working is much easier with a power socket at hand. For María Isabel Benítez, 55, a homemaker, one of the advantages of having electricity is that you can watch the news and find out what’s going on in the country. “I like the 6:00 a.m. news programme, I see everything there,” she said, holding her little granddaughter Daniela in her arms. Elena Gómez, a 29-year-old psychology student, said she can now do her homework on the computer at home. “I no longer have to go to the nearest cybercafé,” she said. The project was considered binational from the outset, since the surplus energy generated in La Joya is distributed to the village of Cueva del Monte, four km away, in Honduras. Additional power lines were installed so the plant can benefit another 45 families, 32 of whom are already connected. “The Hondurans deceived us, they told us they were going to set into operation the energy project, but they didn’t, and we were only left with the blueprint,” Mauricio Gracia, the community leader of the Honduran village, told IPS. The people of Cueva del Monte are Salvadorans who from one moment to the next found themselves living in Honduras, in September 1992, following a ruling by the International Court of Justice, which resolved a lingering border dispute that included the area north of Morazán. Benitez, the president of the La Joya association, said the generator sometimes fails, especially when there are thunderstorms, so the organisation is looking for more support to purchase a second generator, which could operate when the first one turns off. Also, as a community they hope to little by little generate development initiatives, with the electricity they already have, to give the local economy a boost. For example, they have discussed the possibility of promoting rural tourism, taking advantage of the natural beauty of the area’s pine forest and the pools and waterfalls of the Calambre River. The plan is to build mountain cabins, which would have electricity. But the idea has not come to fruition because it has not been possible to reach an agreement with the owners of the land, said Benítez. Meanwhile, Lilian Gómez is happy that there is strong local demand for her charamuscas, which she could not make if electric power had not come to La Joya. The post Farmers Generate Their Own Electricity in El Salvador appeared first on Inter Press Service.